We train educators and advocates from all over the world to seed and grow edible education in their communities. We train educators and advocates from all over the world to create powerful edible education programs in their schools and communities. 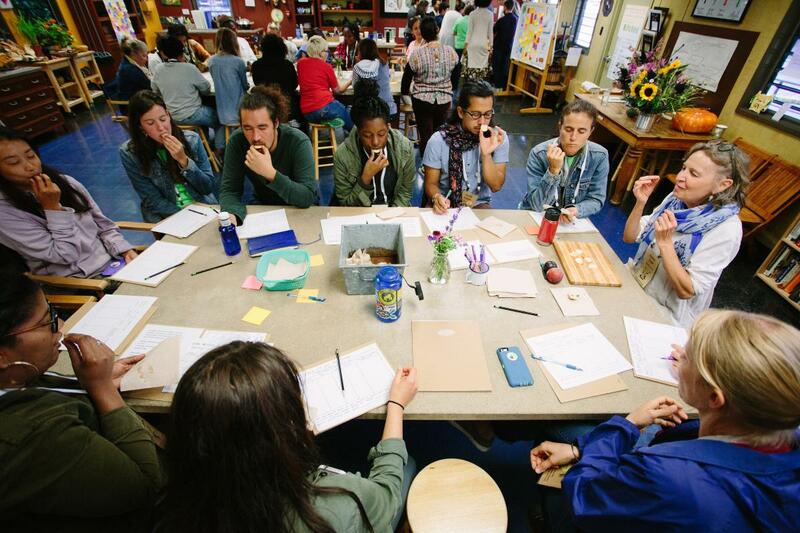 Come experience first-hand the core principles and practical tools for engaging students in academics, social and emotional learning, and justice in the kitchen, garden, and lunchroom. 2019 HAS SOME EXCITING OPPORTUNITIES TO LEARN WITH US! Details for our 2019 Summer Training are posted below. The deadline for all applications was April 5, 2019. Accepted participants will be notified the week of April 15th via email. We also host customized professional development experiences and workshops all year long. Contact us at training@edibleschoolyard.org to learn more. 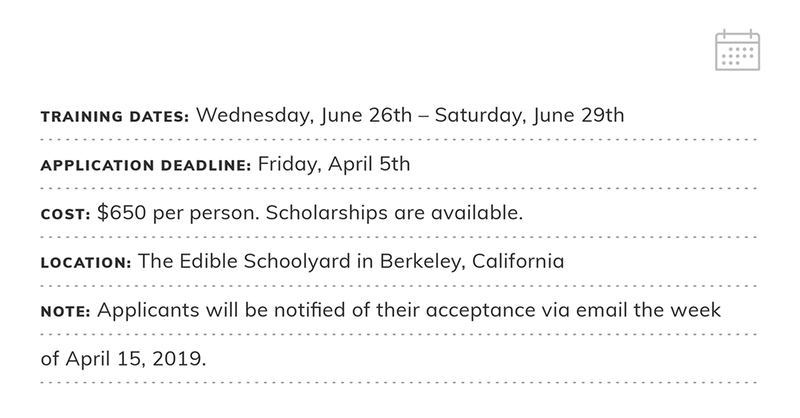 Our summer training will gather 100 educators, farmers, cooks, and advocates at the Edible Schoolyard Berkeley. Sessions will feature Edible Schoolyard staff and partners from across disciplines. This year’s programming will have a special focus on topics related to California, but we welcome applications from across the country and around the world. Have a question? Read our Training FAQ or drop us a note: training@edibleschoolyard.org. What Edible Schoolyard training content will you implement in your school or organization? We will use your dedication to simplistic, beautiful, nourishing experiences to inspire a personal and program reflection on our current work, with the goal of revisiting our foundation and truth. Structure and systems for garden and kitchen lessons. Garden content and we will be meeting as a team to determine which kitchen lessons to implement and perhaps adapt to the school culture and grade levels. Love the Edible Schoolyard content standards and philosophy. Give our students more autonomy around gardening and cooking. More narrative-based lesson plans, handwritten recipes, more thoughtful and involved staff meetings, weaving our values into all that we do, slow down and ensure intentionality and purpose throughout. Systems, systems, systems. The underlying structure for everything helps the focus remain on the kid-centered goals. What one major lesson will you take away from your Edible Schoolyard training experience? It is possible to lead people through a training on edible education in a way that honors what they already know, illuminate areas they discover they know less about and have them come out on the other side feeling good about their organization, optimistic and focused on tangible changes, additions or refinements that feel attainable. That nourishment and deep organization allow people to feel safe and focused and it should often be my top priority with team collaboration. The importance of designing experiences for students that promote their independence (e.g. knife skills in kitchen classroom) and the power of the garden, kitchen program to serve as a locus for developing and sustaining community among school families. One lesson?! Best way to structure lessons, how to begin with an academic standard and an ESY standard and seasonal veggies or garden jobs and create a lesson that incorporates everything. What did you like most about the Edible Schoolyard training? Knowledge and enthusiasm of the staff! Real world application of the work being done at the Edible Schoolyard CAN be implemented anywhere! Interactive, engaging and have very clear learning expectations. That they were thoughtful and relevant, fast-paced and interesting and that the passion and professionalism of the staff was always in evidence. Hands-on engagement, connection, mind, body and spirit to what we were doing. Teaching approach. Diversity in topics and people and honor/respect given to culture. Meeting incredible people! I loved the honesty and transparency – so helpful that you were willing to share challenges and details that many organizations protect and hold internally. How well informed, professional and knowledgeable the staff are. It was really nice to be in a training where the staff REALLY model what they are teaching and give us the time and ability to practice.